Left: Ogata Gekkō (1859–1920). 'Ono no Komachi: Praying for Rain.' From the series Gekkō's Random Sketches. Japan, Meiji period (1868–1912), 1897. Woodblock print; ink and color on paper. Gift of C. M. Cooke, 1928 (06301). Right: Ogata Gekkō (1859–1920). Among the earliest Japanese woodblock print designers to achieve international fame during his lifetime was Nakagami Masanosuke (1859–1920), a self-taught artist who adopted the name Ogata Gekkō around 1881 at the insistence that he was a descendant of the celebrated painter Ogata Kōrin (1658–1716). The venues outside of Japan where Gekkō displayed his work include the World's Columbian Exposition in Chicago (1893), the Exposition Universelle in Paris (1900), and the Japan-British Exhibition in London (1910). Gekkō’s most famous creations depict naval and land battles during the First Sino-Japanese War of 1894–1895. 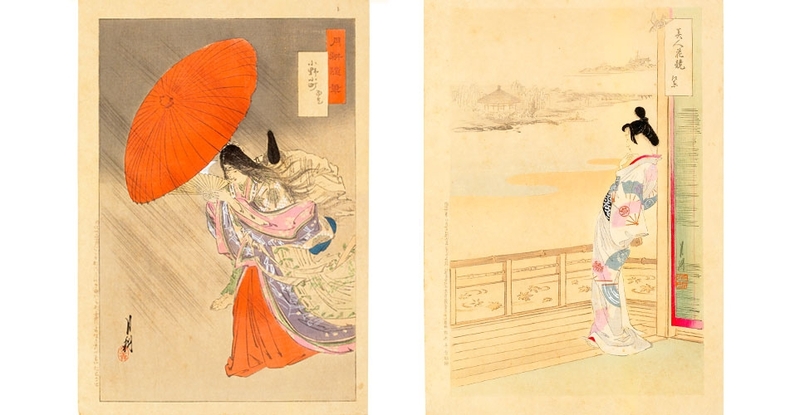 Displayed here, however, are three series of prints that highlight his skill in the genre of bijinga (portraits of beautiful women) and reveal him to be an artist capable of surprisingly delicate, graceful expressions of femininity.